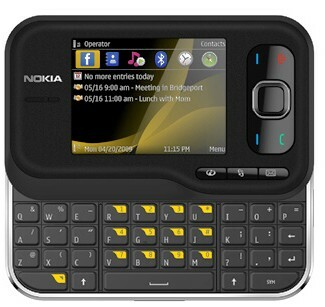 Nokia 6760 slide phone was first launched in US as Nokia Surge . After few months Nokia renamed surge to Nokia 6760 slide and announced its availability for the rest of the world as Q3 of 2009 .Nokia 6760 slide is just another Nokia phone in S60 V3 , the same OS powers the Nokia Nseries and Eseries models prior to N97 ,5800 Xpress music and 5530 Xpress music touch phones.The special about Nokia 6760 slide is that its with a slid out qwerty keypad . Other specifications includes 3.15 MP camera ,128 MB internal memory ,2GB memory card in slot expandable upto 8GB ,GPS ,3G etc . 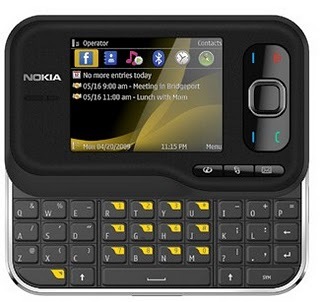 Nokia 6760 slide is well suited for heavy internet users , bloggers and others who are in need of internet or office productivity .The slid out keypad is comparatively larger for typing SMS, email messages ,bog posts etc. 3.15 mega pixel camera with video recording . Bluetooth with A2DP,USB version 2 . Nokia 6760 slide is equipped with 320 x 240 pixels, 2.4 inches TFT screen with support for 16 million colors. Assisted GPS ,GPRS class 10 ,3G and EDGE. Office document viewer ,Full function web browser ,Stereo FM radio with RDS ,SMS ,Email,mp3- video player . Nokia 6760 slide is available in three colors black ,white and red . Li-Ion 1500 mAh capable of producing 5 hrs of talk time . Weighs 124 gm with L*B*W dimensions 97.5 x 57.9 x 15.5 mm, 78.5 cc . Nokia Nokia 6760 slide price : The price of Nokia 6760 slide in India will be around 10K to 12.5 K INR , or even more initially .But it would fall soon as S60 V3 slowly paving its way for S60V5 touch devices . The keypad is especially good for quick typing. i like to buy this mobile.please can u send me the prices from punjab. I like it’s configuration n i m thinking Of buying it. INR? The web is a global entity so it is useless to quote prices in something (INR) that has no worth outside of India. Try using a globally accepted currency – more people will visit your website. The phone looks is great.Is this phone is available in orissa?How much price it would cost? when it will be available in market Rajkot (Gujarat)? what will be marcket value(prise)? I like 6760 so please send me the price in india……. when will you launch nokia 6760 in India ?? ?